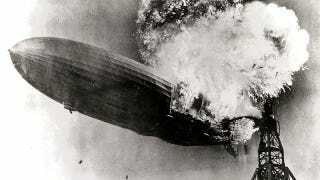 We think we got the first hydrogen-based airship disaster caught on tape. In fact, the first horrific explosion of an airship came over a century before the Hindenburg, and it combined a military test ship disaster with a tragic love story. Air balloons are now the stuff of festivals and the eccentric rich. During the 1700s, when they were invented, they were a military threat. World leaders had nightmare visions of entire invading armies flying over their defensive military forces and capturing their capitals, or simply dropping down on them without any advance notice. Balloons traveled faster than any messengers on the ground. So when balloonists manage to cross the channel, going from England to France in January of 1785, it wasn't just a technological achievement. Though one of the balloonists was French, it was proof that England could reach France with this new potential form of military transport. The pressure was on to show that France could do the same to England. Jean-Francois Pilatre de Rozier was a daredevil balloonist and a patriot. He threw himself into the quest to build a balloon that would get to England. He had previously tried twice, and failed. One of the main problems was that a hot air balloon — which was only kept aloft because its heated air was so much less dense than the atmosphere — required massive amounts of fuel to stoke the fire. Wood is not a light substance, so the fuel for the balloon weighed the balloon down. Hydrogen balloons didn't require heavy fuel, but the gas was tough to come by. De Rozier finally worked out a double balloon. A hydrogen section would keep the balloon aloft no matter what, while a second section would be filled with hot air and stoked by a fire. This put a massive amount of hydrogen disconcertingly close to open flames. The balloon was launched from Boulogne sur Mer in June of 1785. It barely made it over the channel before things started going wrong. First the wind direction shifted, pushing it back to land. Then it shot up even higher into the air. Then people noticed sparks. There are some who say that the balloons never actually caught fire. Others say that they saw flames, but the flames didn't last long. Whether fire was involved or not, the balloons collapsed, plunging 1,500 feet and killing both occupants. Things took a turn towards operatic tragedy when De Rozier's fiancé, who had begged him not to make the flight and had watched him plunge to Earth, killed herself a few days later. People did subsequently make it across the channel from France to England, but as we know now, balloon travel never became the military threat it was made out to be. Today, there is still a balloon that uses both lighter-than-air gas and hot air. It's called a Rozier.